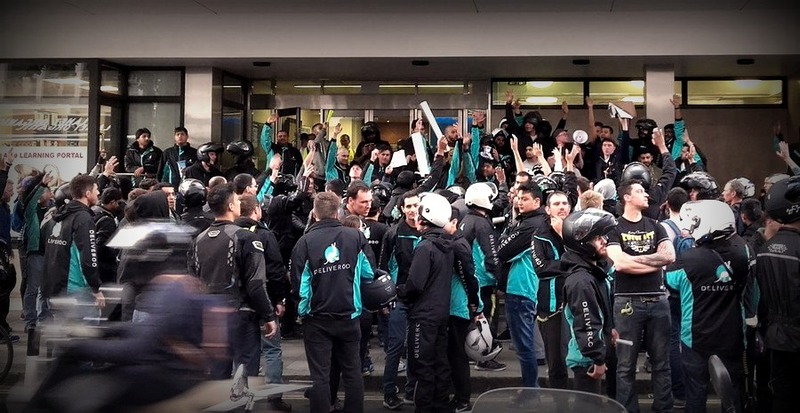 The struggle for decent wages and conditions within the ‘gig economy’ has entered a new phase recently with the Uber court victory and the announcement of a union-building drive by the IWGB amongst Deliveroo workers in London. The initial energy of the summer’s spontaneous strikes is successfully being converted into long-term campaigns. As part of this development, the Plan C Social Strike working group is excited to announce today that we are involved in supporting a new initiative: The Rebel Roo, a national bulletin for Deliveroo workers, produced by Deliveroo workers. The Rebel Roo will work to circulate tactics, ideas, grievances, desires and demands, as well as supporting the development of national (and eventually transnational) organisation. The growth of the ‘gig economy’ is part of a new direction in the organisation of the labour process enabled by new developments in mobile technology and the destruction of the social settlement won by the labour movement under social democracy. Deliveroo is one of the most prominent examples of these ongoing changes in the political and technical conditions of exploitation, and it is vitally important that workers get a handle on how to exert power in this new composition. Copies of the paper are already being distributed, and new issues are expected to be published monthly. In the first issue there are stories from workers in London and Brighton in the UK and from a migrant worker in Marseilles. Between a job and a hard place: A non-workers inquiry. Movement & Organisation / An Inquiry into the Present.